When should you live where? When is a city's best season? Better cities in terms of what? Weather? Costs? Internet speed? Short answer: Better for digital nomads, in terms of … everything. Why? Because the analysis is based on the trip counts – and hence decisions – of people who actually travelled there at that time. Therefore the data includes everything these travellers considered (weather, price, off-season effects, community, workability, friends, etc.) implicitly! The charts are based on all trips recorded by digital nomads on NomadList in 2017: 10,979 trips. I also limited the dataset to the Top 100 most popular cities. If I hadn’t done that, really far-fetched recommendations would appear in the chart - like Dornbirn or Yangon (in January!). Darker green means this is a more popular month for this city, and lighter green means it’s a less popular month – at least amongst digital nomads. Isn’t low season more interesting? You might think it’s smarter to look for a way to trick the system and find a city’s low season – with better prices, for example. And it’s still actually nice there (good weather, etc. )… right? Not quite. If this analysis was based on the average traveller (bound by the holiday season, etc. ), then yes – but arguably, digital nomads are already optimizing their travels. So these recommendations already include this consideration! I don’t know why – ask the nomads … Maybe they’re visiting family. And hey, July is also popular! 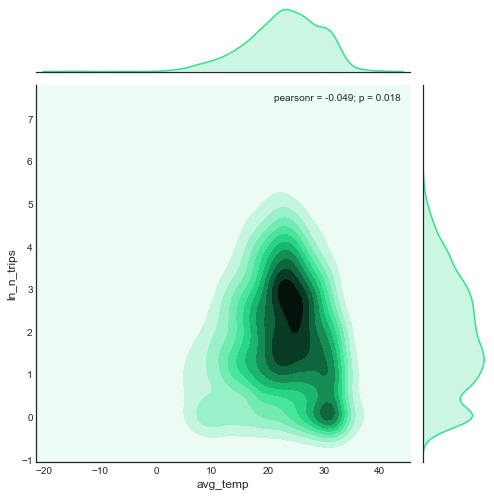 Why is this data normalized? Why not just plot the most popular city overall for each month? Simply because some cities are more popular overall, they’ll spam your recommendation chart. I think it’s hard work to find the right cities to live in for a particular month. This analysis makes it much easier: Instead of going through all the data points (weather, community, reports, etc.) myself, I’m asking a group of – arguably like-minded people – who have already done the work: Where should I go in October? 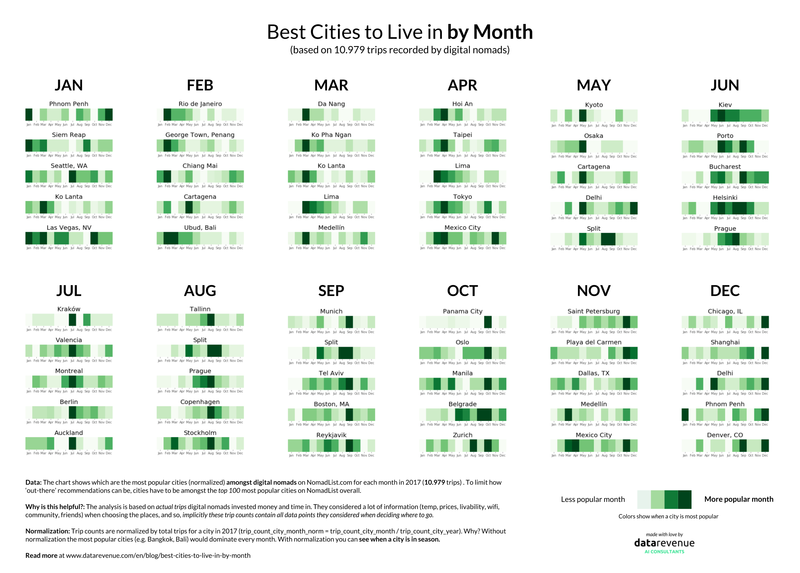 The chart shows which month is the best month for which city. It’s based on the 2017 itineraries of all members of NomadList. Any thoughts? Share them with me: m.schmitt@datarevenue.de. Was kann man aus den Daten von Nomad List ablesen?